Our inmates are only allowed to receive soft-back Bibles in the mail directly from the publisher. They are not allowed to have magazines, newspapers, or any other type of books. The first [right it violates] is the right to free speech guaranteed by the [First Amendment to the United States Constitution], which carries with it the right to receive materials and read. The second major violation the policy makes, Shapiro adds, is a blatantly biased endorsement of religion, since it allows the reading of the Bible but no other religious (let alone secular) text. In their lawsuit, the ACLU are seeking unspecified punitive damages and have asked a federal judge to order the Bible-only policy to be lifted while a jury hears the case. The Berkeley County Detention Center’s policy rouses suspicion particularly because of the nature of the organization filing the lawsuit against it. Quite simply, the prison is refusing literature from a group that defends the rights of prisoners and holds prison officials accountable for their treatment of those prisoners. If prison officials violate the rights of prisoners, those prisoners are unable to articulate a legal argument against those officials, because they have been denied the information necessary to do so. None of this even touches on the accusations that the prison is violating freedom of the press or illegally preferring one religion over another. 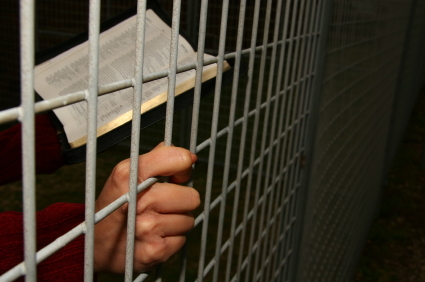 In denying prisoners access to any literature but the Bible, prison officials are not only denying the press the freedom to disperse their literature to those willing to receive it, but they are also denying inmates access to a balance of perspectives; moreover, the perspective that inmates are permitted to be exposed to is strictly that of the Christian Biblical literary tradition, which can easily be seen as illegal government favor for a particular faith group or denomination. As most of our ministers already know, the Universal Life Church Monastery stalwartly defends both freedom of and from religion, as well as separation of church and state. Whether or not the Berkeley County Detention Center has violated the constitution in the eyes of the courts, the press should always have the right to disperse their literature to willing recipients, prison inmates should always have access to literature informing them of their rights, and the government should not favor one religion over another. Give us your thoughts. Do you think Berkeley County Detention Center officials made the right choice in denying inmates any but Biblical literature, or does this action blatantly violate constitutional guarantees of freedom of the press and religious neutrality?